The study, published in Nature Neuroscience, characterized a novel class of inhibitory neurons, called CA-RP neurons. These neurons, located in a part of the hippocampus called CA1, send long-range axons to the retrosplenial cortex. Northwestern Medicine scientists have characterized a brain circuit that sends information from the hippocampus and thalamus to the retrosplenial cortex — an area of the brain involved in episodic memory — and demonstrated how its interactions contribute to memory formation. The study, published in the journal Nature Neuroscience, was led by principal investigator Gordon Shepherd, MD, PhD, associate professor of Physiology. Previous studies have indicated that the retrosplenial cortex processes episodic memory through interactions with the hippocampus and thalamus. But it was unclear whether axonal projections from the hippocampus and thalamus are connected to retrosplenial neurons, and how the projections support retrosplenial memory functions. “Our study fills this major knowledge gap, providing the first detailed cellular circuit model of hippocampal-thalamic-retrosplenial interactions,” said first author Naoki Yamawaki, PhD, a postdoctoral fellow in Shepherd’s laboratory. In the study, the scientists described a novel class of inhibitory neurons in a part of the hippocampus called CA1. 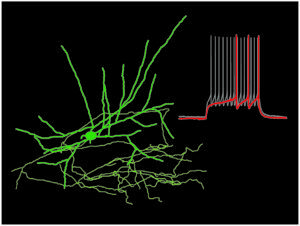 These neurons, which they refer to as CA1-RP neurons, send long-range axons to the retrosplenial cortex. They further found that inhibitory axons from CA1-RP neurons innervate the same part of the retrosplenial cortex that is innervated by excitatory axons from neurons in the thalamus. Together, these axons act in opposing ways to regulate the activity of retrosplenial neurons. 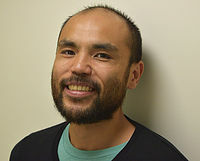 Naoki Yamawaki, PhD, a postdoctoral fellow in the laboratory of Gordon Shepherd, MD, PhD, associate professor of Physiology, was the first author of the study. In experiments led by the laboratory of co-author Jelena Radulovic, MD, PhD, the Northwestern team also demonstrated that CA1-RP inhibitory inputs diminish the formation of memories, while the thalamic excitatory inputs have the opposite effect. Radulovic is the Dunbar Professor in Bipolar Disease and a professor of Psychiatry and Behavioral Sciences, Pharmacology and Physiology. The study’s circuit model provides a valuable framework for scientists to use in future research, Yamawaki notes. The findings also have potential implications for research in areas like Alzheimer’s disease or stress-related disorders, such as post-traumatic stress disorder (PTSD). Previous studies have indicated that in PTSD, the retrosplenial cortex exhibits significantly higher activation when presented with trauma-related stimuli compared to control. In ongoing research, Shepherd’s laboratory is further investigating the cellular mechanisms underlying interactions between the hippocampus, thalamus and retrosplenial cortex. “By establishing that the CA1-RP neurons are a unique cell class and form a unique type of long-range inhibitory circuit in the retrosplenial cortex, our findings open up many new questions,” Yamawaki said. The study was supported by National Institutes of Health grants NS061963, EB017695 and MH108837.